(L-R) Kathy Lawley Best, Mark Chason, and Jennifer Gurske-Deperio. 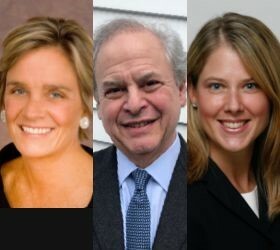 AMHERST, N.Y. – The Daemen College Board of Trustees has approved the appointment of Kathy Lawley Best, Mark Chason, and Jennifer Gurske-Deperio to the college’s board. “We are pleased to welcome such accomplished leaders in our local community as new trustees, and we are confident they will bring great expertise and insight to our board,” said Dr. Thomas Stewart, chair of the Daemen Board of Trustees. Lawley Best serves as head of corporate and community relations at Lawley Insurance, a third-generation family-owned business. Lawley Insurance has eight offices throughout the Northeast, and has consistently been ranked among the Top 100 brokers in the U.S. Active in the community, Lawley Best has served in numerous roles for a number of non-profit organizations throughout Western New York. She holds a bachelor’s degree from St. Michael’s College in Vermont and is a graduate of Nardin Academy. Lawley Best resides in Amherst. Chason is president of Chason Affinity Companies, a leader in land development, finance, property management, and real estate. The Buffalo-headquartered company has administered development projects across the country, including a range of multi-family residential property, condominiums and single-family home projects, office buildings, and land development. Starting his career in the family real estate business, Chason has since been involved in investing and developing more than 10-million-square feet of real estate projects. He specializes in the areas of management, development, construction, and finance. Chason is a graduate of the New York University School of Business. Gurske-Deperio is an orthopedic surgeon at UBMD and a member of the orthopaedics faculty at the University at Buffalo. She also previously served as an assistant professor at Daemen. A graduate of Daemen, she earned both master’s and bachelor’s degrees in physical therapy and went on to receive a medical degree from UB. Gurske-Deperio has been presented numerous awards for her professional work, including the Kenneth A. Krackow, M.D. Research Award and the Dr. Benjamin E. and Lila Obletz Award in Orthopaedic Surgery, among others. She was also honored with a Daemen Distinguished Alumni Award. She resides in East Amherst.